Speaking around the country about all things bike related has given me a few insights about where our communities stand in the evolution towards bike friendly Valhalla – we're talking scalable, livable places where anyone can roll two wheels out the front door without fear… or requesting combat pay. Where a mix of biking, walking, bus and train coexist and find close to equal footing with the car. Since co-authoring and publishing the book, Joyride: Pedaling Toward A Healthier Planet with Mia Birk (reviewed in Cycling Utah’s March 2012 issue online at cyclingutah.com), mayors, advocates, transportation departments and educators ask me to consult them about bike infrastructure, funding, economic impact and that thing… that one magic, sought after thing that will tip a community towards more people riding bikes. Of course I fully disclose that I hold no advanced degrees in urban planning or engineering. They point out that I published a bestselling book that's a blueprint for retrofitting communities, making healthier, cost effective choices. Also, I live more than 50 miles away, which they point out makes me an expert. What I do have, in addition to several years of research gained writing that book, is a lifetime in the saddle. Having pedaled more than 100,000 miles around the globe gives one a unique look at what works and what doesn't when getting ourselves around our communities in style. I take mayors and councilors and the power base of a city out on bikes. For some, it's their first ride. It truly changes their perspective. We look at what is working in their transportation plans and what puts their voters in harm's way. We look at their funding commitments, because cycling is a very cheap date. And I get them to think about cyclists and pedestrians as voters. Many of the barriers are attitude, they ask about the weather, the idea that bicycles are toys or something to use off road only on weekends. I ask them if they are a toy or transportation right now, at this very moment, signaling through intersections and getting from one side of their town to the other?! We talk about how places like Portland, Minneapolis, New York City and smaller communities like Bloomington, Indiana, Harrisburg, PA and Springfield, Missouri, are making the shift and benefiting through better health, higher property values, more disposable income to spend locally… it's not about whether bicycles pencil out financially, it comes down to education and political will and not framing it as car versus bike. We talk about creating bicycle corridors, commuter challenges, in-fill construction that revitalizes urban cores, greenways, bike corral parking to bring more people to individual businesses and on and on. But when it comes time for that magic bullet, the one thing people want to fix everything. I don't have it. There's no wizard, there's no OZ. But if there's one thing that every community needs to push biking over the top, and if not done will surely prevent a city from having bike transportation explode for them, it's a sense of community, showing people the fun that can be had when you ride. Tweed rides, Monster Mash Halloween rides, Pretty Dress rides, Bike Prom, Bike to The Ballgame, Worst Day Of The Year Ride, Bike The Bridges, pub crawls, biking to work and hundreds of other rides a year that ordinary folks undertake. 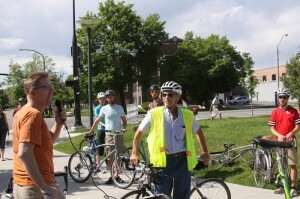 Bike blogs, calendars and forums round out the bicycle watering hole feel of a town. If a community waits for bike culture to come to them, or spring up without friends and neighbors and you diving in, it never will.